These days, a lot of homeowners like to enjoy their backyards with glowing fire pits. A fire pit doesn’t have to cost a top dollar and the size, design, and choice of the material depend on the owner’s preferences. 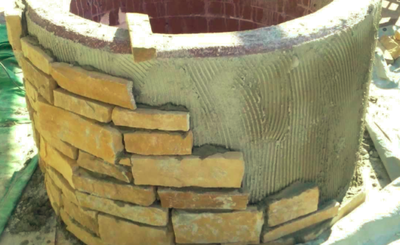 Before building a fire pit, there are several factors that must be considered. Those factors are explained below but before you read, take this number if you want to find a fire pit pro: 916-571-0908. As you explore the different options, you need to determine whether you want your fire pit fixated at a particular place or if you need a portable design that you can take wherever you want in your garden. Perhaps you want it to be your focal point in the backyard, in which case a permanent fire pit is your ideal design. We provide everything you need so you don’t have to move from one manufacturer to the next. 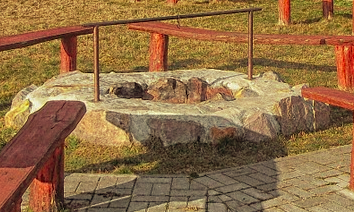 Portable fire pits are basically fire bowls which can be crafted in various materials such as steel, copper, and iron. A fire table is necessary and must match the bowl with a height of a typical coffee table. Another design option is the chimney vent. No matter what fire pit style you want, we ensure that the right stones and materials are applied. Your ideal fire pit must be proportionate to your backyard and there should be an allowance for seating. Contact 916-571-0908 now for free quotes. A portable fire pit is best set on top of a surface like gravel, concrete, brick, slate or even a composite that is fire resistant. It is not recommended to put on the wood deck since the embers tend to fly. A base that is made of gravel is a good choice for building a fire pit that is permanent. Getting it right with the leading masonry providers saves the day for you and your needs. It is recommended to install a fire pit at least 10 feet away from the house or a neighbor’s yard. That is what fire department rules require. Sometimes, a permit is needed and a thorough inspection from local authorities for safety reasons. Anywhere near hanging branches, fences, or structure is not a good place for installing a fire pit. 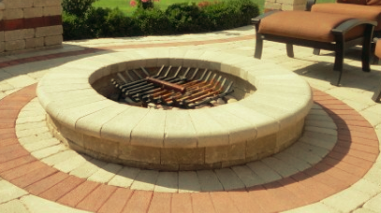 Ask for fire pit installation from our skilled concrete contractors.